The much-loved RPG choose-your-own-adventure series returns, this time with a horror theme. If the name Ian Livingstone linked with the term Fighting Fantasy causes shivers down your spine, you're going to love this one. Livingstone is better known for his role at Eidos these days, but many moons ago he and Steve Jackson - the Games Workshop man, not the head honcho of Steve Jackson Games - created the Fighting Fantasy series of books. Livingstone has announced his return to the series that kicked off his gaming career with a new book, Blood of the Zombies. In Fighting Fantasy the reader chose his or her own path to victory, battling their way through the Citadel of Chaos, Deathtrap Dungeon, or perhaps even facing off against the Warlock of Firetop Mountain. "When the 30th anniversary [of The Warlock of Firetop Mountain, the first book in the series] was coming along," Livingston said, "I thought it would be great to celebrate it." Though he would have liked to get Steve Jackson on board again it wasn't to be, so Livingstone decided not to tackle a revisit to Firetop Mountain itself. Instead he went for modern horror, a genre that Livingstone himself never tackled but which the Fighting Fantasy series did dip into several times. "I really enjoyed doing it," Livingstone said, "I had forgotten how much fun it was writing them and creating tantalizing paths to lure people down knowing they're going to meet a horrible end if they chose that path." In the books, you played as a fantasy hero - perhaps a wizard, a warrior, a rogue or something similar - sent out on a quest. The objective could be anything from "find the treasure" to "survive," and failure usually meant death. To play, you started at the opening sequence and then chose which route to take; perhaps that room over to the left held a vital clue, or maybe the bridge over the underground river off in the distance led to somewhere interesting. There was only ever one path to victory. Speaking as someone who played Warlock of Firetop Mountain to tatters, more than once I actually managed to beat the warlock only to realize to my horror that I hadn't picked up exactly the right keys needed to open up his magical chest and claim the loot. That kind of defeat was part of the fun, but it also meant you'd be replaying it again and again to find the right combination of choices that led to fame and glory. Livingstone doesn't expect the book to revive the Fighting Fantasy franchise, but he's already got a horde of devoted fans invested in the project via Twitter. Moreover it won't just be a book project this time, as Blood of the Zombies will also be a mobile platform release. 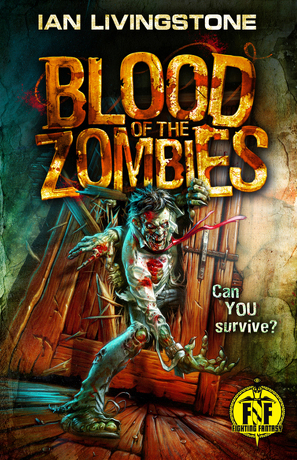 Blood of the Zombies will be out in August 2012.